A lot has happened and it’s time for an update on our campaign to retain Victoria Hall as its founding fathers intended when they donated their money to build the place a century and a quarter ago. A big thank you then to everyone – there were 277 of you – who wrote in response to the Council’s consultation on its plans to hand over the hall. A further 1400 people signed the petition to the Charity Commission to emphasise just how unpopular the idea is. The consultation is now over and at first sight you might wonder whether your efforts were in vain. At a meeting, stage managed so cynically it would have embarrassed the Chinese Communist Party, Ealing’s General Purposes Committee (GPC) waved throu gh the Council’s regeneration director’s report on the consultation without a care for what you said to them. The officer – who is soon to leave the Council – read the committee a list of your objections as he had categorised them only to dismiss everything you said. He then held up a bundle of papers that he said were printed copies of your objections and invited the Committee to take a look if they were interested. No one took up his offer and the Committee voted on party lines to allow council officers to go ahead with the sale. However, as Ealing Voice has said all along, it isn’t so easy. The Victoria Hall is governed by a trust that kept it separate from the rest of the Town Hall. As a charity the trust falls under the jurisdiction of the Charity Commission whose task is to enforce the rules charities have to comply with and ensure the trust is properly managed. As the trustee, the Council must be fully accountable for its actions, be open and transparent in its dealings and keep the interests of the charity completely independent from those of the Council. This has just not been the case with the Victoria Hall. No accounts of the charity have been kept, the Council advertised for its disposal along with the rest of the Town Hall without even mentioning the existence of the charity, and it is now taking legal advice about the disposal that the Council says is privileged and cannot be made public. If the hall is handed over to Mastcraft the trust and what it stands for will die. 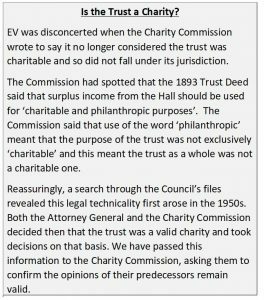 So Ealing Voice is asking the Charity Commission to assert its role – if necessary by removing the Council as the trust’s trustees. We have got a long way in this process, but charity law is complicated and we think we may now need some legal help to drive home what we have achieved. We shall let you know what advice we receive. And watch the Ealing Voice website for updates. UPDATE – the Charity Commission has now confirmed that the trust is charitable and is under their jurisdiction. Let us keep up the pressure, bravo! Why is it that Ealing council fails to live upto it’s own Labour principles of listening to the will of the people again and again? There is a huge feeling of mistrust between residents and Ealing Council. We can only speak as we find; and we have found them to ride rough-shod over public opinion on so many occassions when it comes to providing and preserving places where people can be in community with one another in the way that the providers of OUR public buildings intended and desired.